A collection of paintings and sketches that document and describe many memorable observations, mostly form the last twenty years of birding around the British Isles and Eire. From patchworking to twitching, all these drawings and paintings illustrate a particular moment. Many of the captions are taken from Michael’s field notes written at the time of the observation. The pictures reflect Michael’s continuing delight and fascination with birds. Michael Warren’s regular visits to Langford Lowfields, a gravel pit in the English Midlands, longer journeys, for example to Scotland, to see particular species and occasionally to ‘twitches’, allow him to study birds, their behaviour, habitat and weather in the field. Sketches and notes can then be used to create a studio image in a well-designed harmony of colour and texture. This, the artist’s fifth book, is a superb collection of drawings from his sketchbooks and field notes, also over 60 new paintings. Warren’s favourite bird is the Northern Lapwing Vanellus vanellus, and he also declares a special fascination with beaches. Lapwings certainly feature here, as do, wonderfully variegated in colour and composition, beach and other scenes. Many other birds, arranged in systematic order and with brief captions, are depicted, and both they and their habitats confirm Michael Warren’s outstanding artistic skills and knowledge of his subjects. Personally I really love his work…To create this book, Michael Warren looked back through his diaries and sketchbooks to recall birding experiences in various parts of Britain and Ireland. He then created more than 60 new paintings to bring those sketches to life. The result is a mixture of rough pencil field sketches and feather perfect watercolours…the decision was made to follow the systematic order, starting with divers and ending with buntings. this approach works, and means that you can logically work your way through the various families…Every picture conveys movement of some kind, on the part of either the bird or its surroundings; a Dipper sits quietly by a rushing stream…his paintings have always tended towards exaggeration and that’s what makes them exciting…this is a great book, and if you like paintings that motivate you to grab your binoculars and go out birding, this is definitely one for you. ….In some ways, the book could be described as a bird-artist’s field guide…. It is almost impossible to select the painting I would most like to see on my wall…. OK, it’s a fair cop, I’m an unashamed fan; but then it is very difficult not to be. Mike is a master of composition and design, but the skill that puts his paintings onto another level is his ability to place the bird naturally into its habitat…. Again, those at Langford Press deserve to have praise heaped upon them for maintaining the high standard they have set with this series of sumptuous volumes. Judging by their latest catalogue, I won’t be stuck for things to put on my next Christmas list. 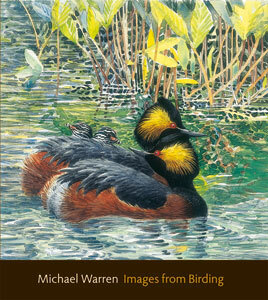 This fine tome charts most of the species that Michael Warren has encountered in a lifetime’s birding in Britain. It ranges from his coloured sketches through to sumptuous, lively, detailed full-page colour composition spreads in watercolour or acrylic. It is a pleasure to see so many previously unpublished paintings in print as well as many personal anecdotes and field sketches of birds. Another feast of images. Michael Warren fans will certainly want to add this to their collection. His paintings combine sharp field observation and birding knowledge with great technique, design and compositional skills. Mike produces pictures that are often dramatic and strikingly coloured, and which evoke exciting moments in the natural world. showing pencil and coloured crayon drawings from his sketchbook…they are beautifully reproduced. he shows his command of a range of styles from loose and impressionistic field sketches to accurate illustrations of the birds. His pictures and sketches have a wonderful sense of movement; of rushing water, lapping wave, whirling flocks of birds, running waders. This is a worthy successor to his previous volumes.